Freshly baptized, I begin my journey into doubt. Those words sum up most of my adult life. It's an odd credo, indicative as it is of the lack of a creed, but there really are no other words to describe my spiritual journey. I began wrestling with unbelief when I was in middle school. I idolized my father, the small-town minister, and even though my pubescent sensibilities wished there was more adventure in his sermons, I loved hearing him preach. The old church in Emmett, Idaho, was a safe, comforting place to me. Outside its walls, though, I was suffering the worst years of my childhood: merciless bullying; constant reminders that, as a non-Mormon, I was an outsider; and worst of all, the knowledge that, as much as I admired my father, most of the town looked down on him. Why, my young mind wondered, would God allow such storm and stress to fall on our family? Despite these growing doubts, I took confirmation classes from Dad, never thinking for a moment that I had a choice--I was, after all, his obedient first-born son. It was more than family loyalty, though: deep down, I hoped I could learn to have faith. That's not what happened, as much as I wanted it to. The class ended, and we moved to Philomath, to the only Methodist church in the Oregon-Idaho Annual Conference that had an immersion baptistry. Most Methodist children are baptized with a sprinkle as infants, but I, and two of my brothers, had been born while our father was still a Baptist, so rather than receive that symbolic drop of water, we were "dedicated"--essentially the same ritual, but without the water. The idea in both rites is that, having been born into a church family, the child will be raised to embrace the faith when he or she comes of age. For a Baptist, that meant receiving baptism at that time. Unbaptized as a baby, I needed that now, and with an immersion baptistry right there in the church, of course I was going to receive the full treatment. Maybe this would do the trick, I told myself. Going under, coming up, just like Jesus in the Jordan River--how could I not have a profound religious experience? The heavens would open, a dove would descend, I'd hear the voice of God announcing, "This is my beloved son, in whom I am well pleased." At long last, I could replace my doubt with faith. The night before the service, I was in the sanctuary with Dad, practicing my part of the ritual, as he filled the baptistry, a tank the size of a hot tub set into the wall behind the altar. It took a lot of water. Dad was filling it with hot water, expecting it to cool to a comfortable temperature by morning. I was nervous and excited, hopeful for a final conclusion to my spiritual ambivalence. The next morning, the moment came in the service when Dad and I left the sanctuary to change into our baptismal robes. They were white, and reached to our ankles. The hem at the bottom was weighted to keep it from floating. As the congregation sang hymns, we climbed up, then down, the steps into the baptistry. As soon as my feet entered the water, I knew I was in trouble: despite having almost twelve hours to cool, the water was still uncomfortably warm, probably ideal for soaking sore muscles in a Jacuzzi, but not something I was going to want to plunge my face into three times. Even so, I stood in that hot water, immersed up to my navel, answering the questions my father asked me: Yes, I believed in Jesus; yes, I wanted him to be my Lord and Savior; and yes, I wanted to be baptized. Then he put an arm behind my back, put his other hand on my forehead, and tipped me backward into the water. He couldn't get my face under. I wanted to go all the way under, wanted desperately to be fully immersed, but instinctively, my body fought it. The water was just too hot. It was over my ears, my hair was completely in, but my face would not go an inch lower. I felt Dad gently pushing on my forehead, trying to get me the rest of the way in, but he didn't force it. With my ears under the water, I never heard him say the words: "I baptize you in the name of the Father, and the Son, and the Holy Spirit." (He might have said "Holy Ghost"; it was 1975, and the old language was still in the ritual, but as I said, I couldn't hear.) Finally the pressure eased up, and he let me stand again, and led me out of the baptistry, back to the changing room. Walking back to that room, I was numb with disappointment. There had been no light from heaven, no dove, no voice of God, no inner sense that now, at last, I could believe. I felt no serenity, no joy, no awe, no gratitude at finally being reborn into the family of God. All I felt was wet, the same way I felt a couple of years later when, during swimming lessons, I had to jump in the pool with my clothes on just to feel what it was like, should I ever need to escape from an overturned boat or submerged car. It was a thoroughly unpleasant feeling. 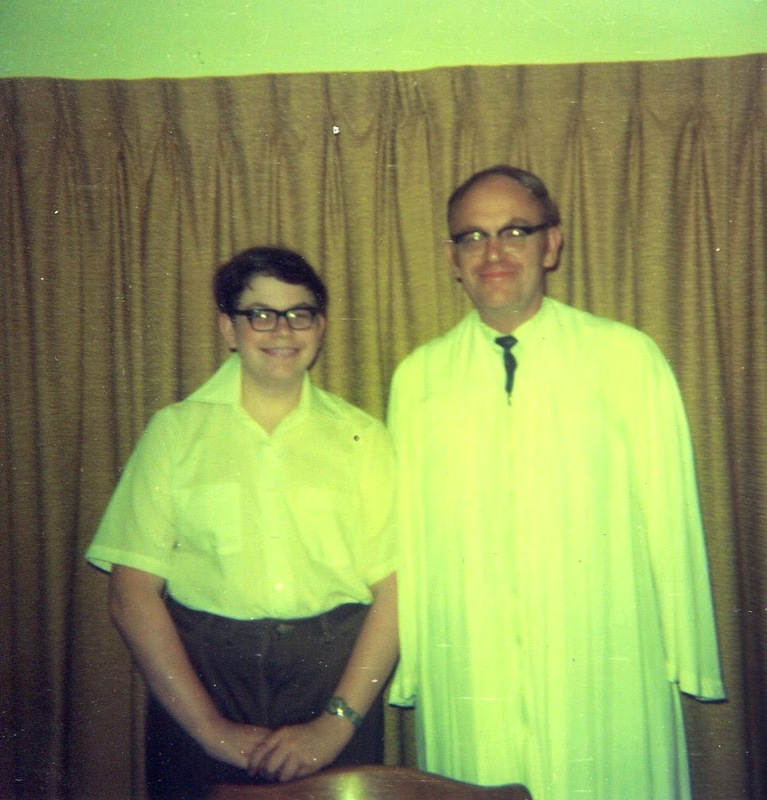 I unzipped and hung the dripping road, peeled off my drenched underwear, toweled myself off as thoroughly as I could, as did my father, then dressed in my Sunday clothes, the white shirt and high-waistbanded pants, the dress socks and shoes, and followed Dad out to the sanctuary to be confirmed, answering the remaining questions about supporting the Methodist Church with my prayers, presence, gifts, and service. And that was it. I was baptized, I was a full member of the church, I was as ritually reborn as it is possible to be. For all that, the exact opposite of what I'd hoped for had happened: I'd discovered there was no magic in the symbolism. If anything, baptism had cleansed me not of sin, but of what passed for faith in my 14-year-old heart. For several months, I wondered if I was to blame for that: perhaps, I speculated, if I could have just overcome my instinctive resistance to being parboiled and let Dad plunge the last inch of me under the water, it all would have happened as I hoped. Perhaps I wasn't even really baptized since, as the joke about Billy Graham and the Scottish Presbyterian goes, "It's the top of the head that matters." Forty years later, I know that my baptism actually was a rebirth. It was the moment I truly set out on a spiritual journey that would take me far beyond the inherited dogmas of being born into a church family, to fantastic and beautiful places, to the depths of despair, to summits of exaltation, to a fifteen-year exploration and practice of ministry, and ultimately to a place of pious agnosticism.